For all the spins this scribe has given Traced in Air, the one resounding thought is how different the world is from 15 years ago. Discounting things on a personal level (I was in the 5th grade – that’s right), the metal underground is a drastically different place. There were no ‘zines like Blistering, no message boards for the “scene police” to espouse their verbal diarrhea upon, no zillion sound-a-like bands (although the death metal copycat boom was just about to happen), and no available record company at every turn. All of this makes one wonder how Cynic would have fared had they more resources and a stronger underground base. We might not of had to endure 15 years between albums. 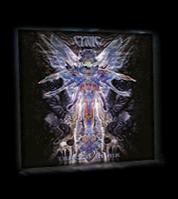 Then again, there was never supposed to be an album #2 for Cynic. Around 1994, the band had grown disinterested in the progressive death metal sound they helped usher in with the groundbreaking Focus and morphed into the far more mellow Portal. Instead of following up Focus, the band did the wise thing and put Cynic on ice, for what seemed to be forever. The good looking corpse of Focus was supposed to be Cynic’s only contribution to the metal world, but as singer/guitarist Paul Masvidal tells us, the universe had its own plans for Cynic. Late October of 2008 will see Cynic (rounded out by drummer Sean Reinert, bassist/chapman stick Sean Malone, and new guitarist Tymon Kruidenier) return with Traced in Air. An album that has succeeded all expectations, Traced in Air can proudly stand beside Focus in the prog death annals and is even more melodic and ethereal than its predecessor. The weary strands of death metal are hardly evident, replaced by a malleable, supremely melodic atmosphere that allows for songs like “King of Those Who Know,” “Adam’s Murmur,” and the haunting “Nunc Stans” to take almost a futuristic, supernatural form. The soft-spoken and cerebral Masvidal phoned Blistering to discuss the reformation and a variety of topics, including his tenure in the Florida death metal scene, his short-lived stint in Death with childhood friend Chuck Schuldiner, and plans for the future, which at this juncture, seem to be a reality. Blistering.com: Fifteen years removed from Focus, what stoked the fires to get back in and do a new album? Paul Masvidal: It started with the 2007 reunion tour which happened as the result of a bunch of synchronicities. It started with a dream from a Russian fan where he went to a festival and Cynic played and it was really cool. Then after that email, there was a series of events that brought Cynic back into my life and there were probably seven total in the course of two weeks that were just…one of those if I was willing to pay attention – which I was – the universe was saying, “You need to get back together.” It was the combination of more phone calls, emails; just Sean (Reinert) and I had the same dream, and then Kelly (Shaffer) from Atheist calls and tells me I have to do this. We had really closed the door on Cynic and never intended to open it again, then all of sudden it appeared dramatically in a concentrated period of my life and I just responded to it. I called Sean and at one point and said, “We got to do this” and that was the beginning of the reunion process. We didn’t intend to make a record. We just thought we’d get out there and share Focus with people again and that generation that didn’t get to see us back in the day. We got back from the tour, and had “Evolutionary Sleeper” that we played just as an experiment. It was a song I had that felt very Cynic-like to me and the response was really incredible, almost on the verge of overwhelming. I got home from the tour, sat down and looked at my stuff and developed ideas and started developing some stuff. I got Sean in here, jammed, worked out ideas and we knew, after a couple of rehearsals, that we had something to say, our return was purposeful. Blistering.com: Are any of these songs left over from the period in 1994 when you were trying to do the follow-up to Focus? Masvidal: Everything is brand new. I’d say 10% of the album is the stuff from my library, just miscellaneous ideas I developed further. The post-Focus period for us is Portal. We recorded 10 songs that were where we were going, which was not Cynic at all. It was a whole different sound and we brought in a female vocalist and got really mellow without any distortion. That was where we were in ’94. We wouldn’t be able to make this record back then. We were in a completely different place. Curiously, it seems for us to have taken this long just makes sense. This is the record we were supposed to make as an album #2 because there really wasn’t a second album in the mid-90’s for us. Blistering.com: While on the subject of Focus, are you surprised as to how well it has held up over the years? Masvidal: It was surprising, completely out of left-field. Focus was a record we poured our hearts and souls into, gave it everything we got, and then let go of it. Fifteen years later people are calling it this influential and groundbreaking album, but for us, it was just a record we gave everything we had. I don’t think it’s possible to calculate, you know, making a classic. You can’t do that as an artist. You do your best and trust your instincts. Blistering.com: Any temptation to go back to Morrisound Studios and play it safe? It appears that in the end, Warren Riker (Down) was the right guy for the job. Masvidal: Morrisound wasn’t even a thought in our minds. We’ve been living in California for 12 years; Sean’s been here for 11 or 10. We’re elsewhere now, we’ve moved on. Warren mixed the AeonSpoke (Masvidal’s side project) album and that’s how met him and we just stayed in touch. He’s one of these amazingly talented engineers where I can show him a painting of the notes of the artwork and tell him this is the vibe of the tune, and he gets it. Sean and I produced the record, so Warren was brought in as an engineer, but he’s so gifted. He’s really got a great sonic-sense. We’re really happy to have made a record with him. It was a lot of fun. Blistering.com: Vocally, you’ve developed quite a bit from Focus. Masvidal: Yeah, I think I feel more confident. Having been singing and writing songs actively for the past 15 years with just an acoustic guitar or piano, it just forced me to develop my melodic sense and comfort level. Playing a lot of gigs with a guitar and no band, it puts you in a really vulnerable and exposed environment. I think I’ve gotten better. I feel much more confident in my approach and how I sing in general. That’s just the result of doing it for years and years and gainfully, it seems to be a big part of the record in terms of how the songs developed melodically. Masvidal: It’s almost like a classical kind of vibe with a 1/5 thing happening. The verses are futuristic and modern. It definitely has a lot of different things going on. Lyrically, it’s basically a song about self-healing. It’s using a metaphor from the Adam story in the bible, but not in a Christian-sense. The wound that Adam takes on parallels with our wounds as a human and how we essentially, we’re in charge of our own healing in terms of disease processing. Blistering.com: “Integral Birth,” the lead single, is perhaps the most melodic thing you’ve done. Masvidal: It’s super-catchy and in your face. It’s got energy and driving – I definitely connect with that tune. It’s a really intense ride. Masvidal: It’s the birth and the death. For me, it’s almost the being on the cover represents this half-alien, half-angel being that is a having a human experience and this is their journey. The riffs are the same, but they’re in different keys. It’s the same rhythmic idea, just arranged a bit differently. “Fluens” is the birth song, the creation; it’s grueling, gestating birth process. “Stans” is the farewell, the death song. It definitely has a haunting, moody quality, but has an introspective look at the life experience in a pretty heavy-handed way. Blistering.com: On the live front, how are you going to balance the two albums? Masvidal: For the Euro tour with Opeth, I think we’re getting 45 minutes, which is pretty good. We’re going to do a combination of the new record and the highlights from Focus and what is really great is now we have enough tunes to mix it up and try different things. It will be an experiment, but it’s all about Traced in Air right now. Blistering.com: Around the time band dissolved in the mid-90’s, were you still an active, functioning member of the Florida death metal scene? Masvidal: We had been in the thick of scene since our teens. I missed my high school graduation to go on tour with Death. This was a big part of my life from an early age. I think what happened was, part of our frustration was about the business which was eating us alive. We were just really sensitive, creative people that wanted to make music and we were devoured by the industry and we didn’t get a lot of support and people didn’t understand Focus at the time. It was a hard road. I think we were emotionally distraught over a number of things. And also just getting into different kinds of music. I was getting into jazz and trippy, ethereal music and I just wanted to expand and go in different directions and I felt we were put in a box with the Cynic experience and we just wanted to break out of it. That’s why Portal happened. We were just morphing and changing. Life just does that and I always feel that it’s important to listen to as many different things as possible and be open all forms of music. Cynic is a return to innocence for us. It’s really our roots. This is where we grew up, what we started doing. Making this record for us has been like becoming kids again and tapping into that pure state where it’s just really a band and free and there are no rules and we can do whatever we want. It’s been cool to come full-circle and be in this headspace. Blistering.com: What has it been like to work in a non-pressurized situation? If you consider where you were with Focus and the label you were on (Roadrunner), it’s a different ballgame. Masvidal: I couldn’t make a record with expectations and pressure. I wouldn’t be interested in a creative process where I’m stretched out. That doesn’t make sense to me. That’s part of the joy of being in this process now and having to make a record like this is that we had such a good time making it. We really enjoyed every step of the way. It was natural, organic, inspired. It came from a great place. It’s really good to be here now and to be doing it with a different head. I think life has done of us is that over the years, we have gotten better at learning how to navigate through this crazy business. Blistering.com: What were some of your fondest memories being in Death and doing the Human album in ’91? Masvidal: It’s weird. It’s blurry at this point, but Chuck was a friend from childhood and someone I had a relationship [with] for years, way before we made Human. It felt natural and easy to make the record with him. It was a part of our evolution as friends; it made sense to make a record together. He was somebody I had a lot of respect for. He brought Sean and I into the thick of the music industry and gave us a lot of experience that you don’t get at that age. I’m grateful for that. I’m grateful for seeing how he worked and his dedication to his craft. He was definitely dedicated to what he was doing. Chuck was in his own head and had his own vibe which was completely different from what we were doing. Seeing someone that was out there making a living as an artist, working and all that was really cool. Blistering.com: Was there any consideration at all in terms of sticking it out with him? Masvidal: I might have passed through our brains for moment, but Death was a full-time job and I wanted to do Cynic. I had my own vision and path as an artist to pursue and we realized that if we stayed with Death, it would have been next to impossible to do Cynic and even make the Focus record. We had to make a decision – are we going to follow our path and do Cynic or are we going to give our careers to Chuck? I realized I wanted to do my own thing. I wanted to give my love and energy to my own voice and my own path as an artist. Death was Chuck’s gig – his songs, his vision. When you worked with Death, it was Chuck, it was his vibe. I had my own journey to make and I needed to take it and I’m glad we went the road we did. It made more sense to do Cynic and do what was honest for us instead of being side-guys. Blistering.com: Have you ever gone back and wondered what path you career might have taken had you done the follow-up to Focus in the mid-90’s? Masvidal: It’s occurred to me. I think we’d be in a whole different place. We’d be on album #8 or #9 at this point if we were busting out albums. It’s an interesting thought to imagine if Cynic never stopped, what would these albums and our journey been like? I realized that it was going to happen that way. We changed so much post-Focus. We were in a completely different place. It would have been unnatural – a forced thing. We’ve never been about that. Our whole gig has been about being honest and true to the whole process and being real with where we’re at. Blistering.com: I know we’re way early in the stages here, is there any deliberation to a third album at this point? Has it at all crossed your mind? Masvidal: It has. It’s impossible to predict the future. I really don’t know, but I do know this – I know this is not a project for us. We’re not treating this as a one-off and we feel really inspired about everything and feel really great about where things are going. I can see it. I just don’t know how or when. I’m so consumed with this album that it’s hard to make it beyond today, but that’s just my way of living. I like to stay present with my life and my experience and not get caught up in some unforeseen future because it’s never what you imagine it to be. Right now, I feel great. If now is the indication of the future, we’re looking pretty good for album #3.